This gold Irish ring is a unique method for praying the rosary. This Irish rosary ring has been hallmarked 10K gold by the Irish Assay Office at Dublin Castle. This 10K yellow gold rosary ring features a 5/16” wide crucifix along with 10 knobs that represent a decade of the rosary. 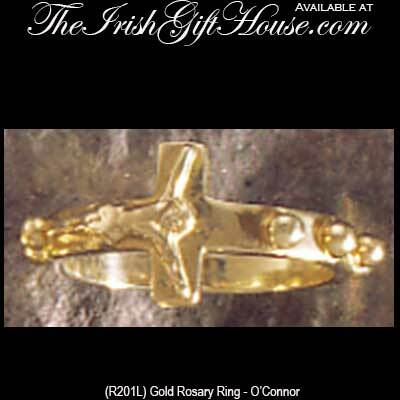 The gold ring was made in Dublin, Ireland by O'Connor Jewelry and it is gift boxed complements of The Irish Gift House.